Whether you're playing blues, rock, classical, or folk-all thechords you'll need are here. Even Eric Clapton started with a few basic chords. And GuitarChords For Dummies offers guitarists of every ambition, skilllevel, and musical genre a key to the simplest and most complexguitar chords-over 600 in all. Illustrated with a grid showing theposition of the fingers on a string, a photograph of the chordbeing played, and a brief comment on the chord and how to play it,this handy, portable reference offers musicians, whetherexperimenting at home or playing in a coffee house, instant accessto the full range of chords that can be played on a guitar. - Covers the theory and techniques of guitar chords. - Features a handy, portable design, which can fit into a guitarcase. 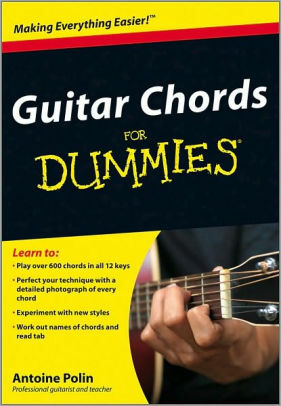 - Includes a convenient lay-flat (wire bound) format, allowingusers to easily try out new chords. An ideal resource for broadening musical technique and gettingnew ideas, Guitar Chords For Dummies will help you, whetheryou're just picking up the guitar or a seasoned musician, addsparkle and range to your musical repertoire.